I have been excited and dedicated to bring frontier research in machine learning and language understanding into the industry to impact human lives. I was one of the founding engineers (#4) of Lattice Data, a Silicon Valley startup in the field of data intelligence. 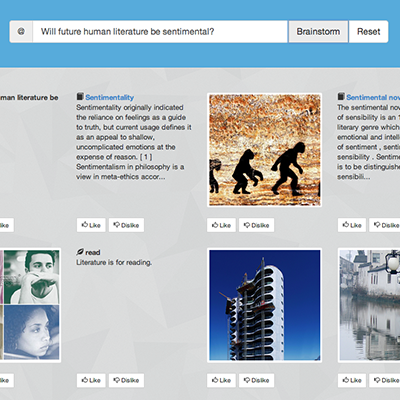 Our mission was to turn Dark Data into structured knowledge bases. The startup has been acquired by Apple. I've been working at Apple since then. I obtained my Master's in Computer Science in Stanford University. At Stanford, I was a research assistant with Professor Christopher Ré in InfoLab. 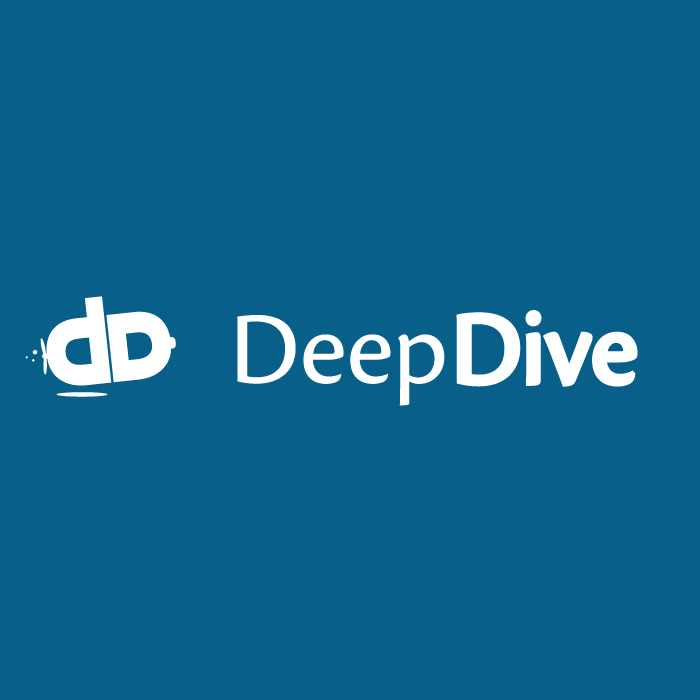 I was one of the major developers of DeepDive, a well-recognized scalable general probabilistic inference engine that was later commercialized into Lattice. I got my Bachelor's in CS from Peking University. I was a visiting student at Technion--Israel Institute of Technology on a Research Exchange Program. I was a research intern at Toshiba in Tokyo, and Tableau Software. For my full profile, see my LinkedIn page. Employee #4 and Staff Engineer at Lattice Data, acquired by Apple for ~$200M. Expert in transforming unstructured “dark data” to structured knowledge. Architected inference engine, information extraction modules, pattern language for distant supervision, and distributed execution frameworks. Built many applications that turned into shipped data products. Led a team of 6 engineers to build tools for machine learning platform. Mastered engineering workflows for data quality and mentored teammates. At Stanford, I was a research assistant advised by Professor Christopher Re, working on building and using knowledge bases. 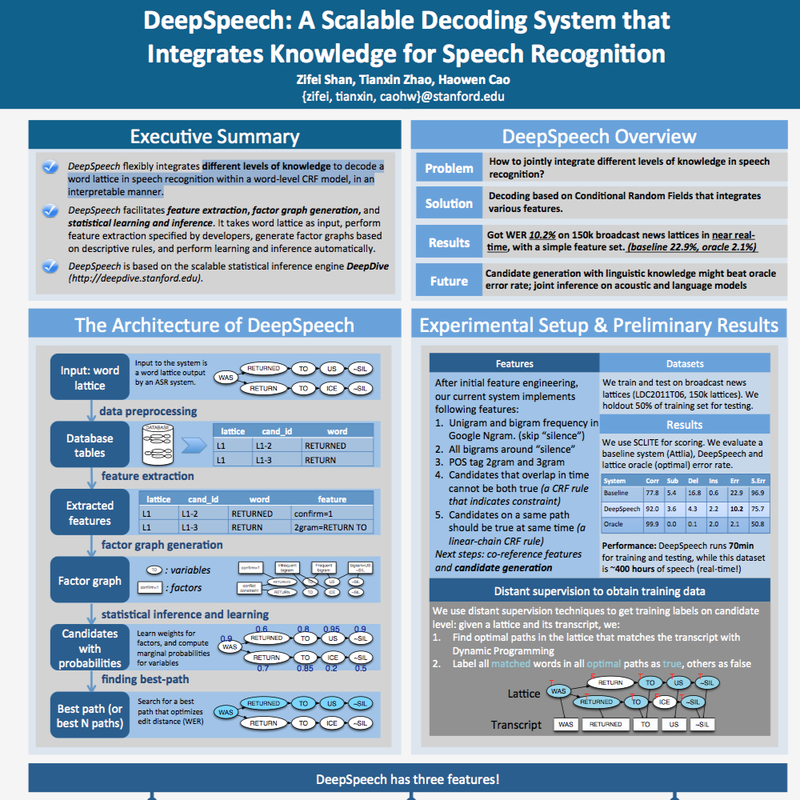 I was one of the active contributors of DeepDive, a scalable probabilistic inference engine well-received by both academy and industry. Led a project in patent analysis. 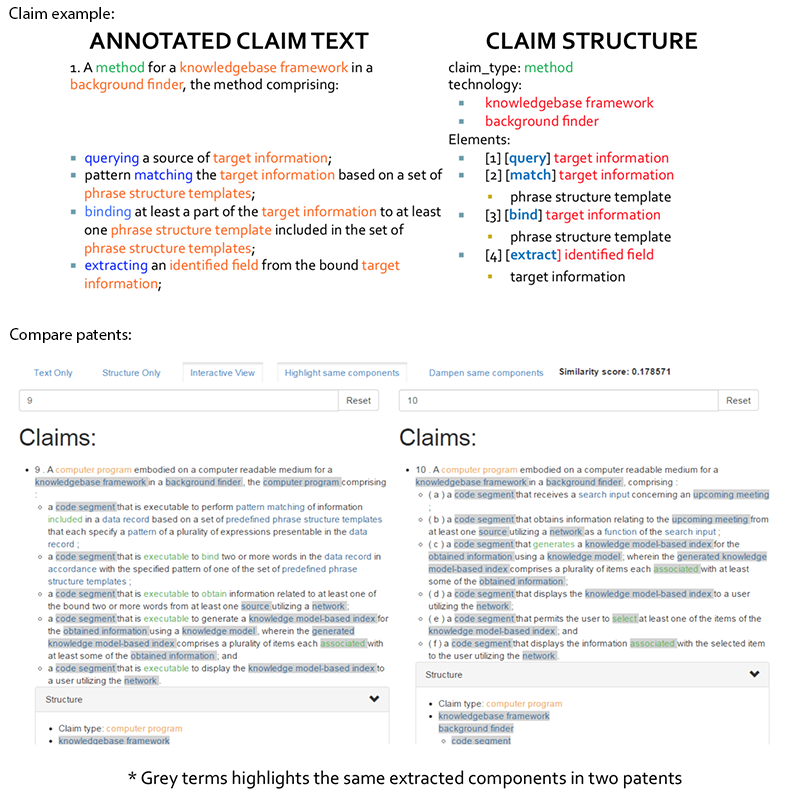 Extracted patent claim structures using probabilistic relation extraction techniques. 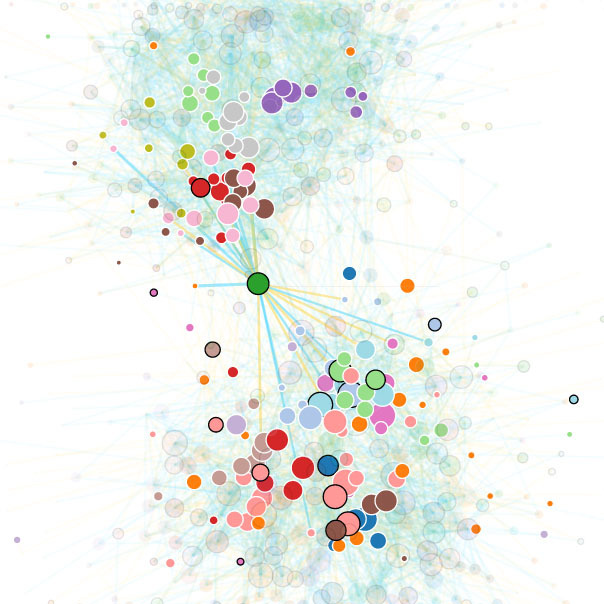 Built a system that visualizes, compares, and searches patents, with the help of extracted structures. Published work on SIGIR 2017. Collaborated on constructing knowledge base for semiconductor material attributes from research papers, using machine reading and relation extraction techniques. Worked on backend functionalities of the new generation of Tableau Server, including user and group logics, and general internal tools. A major contributor of the Stanford DeepDive project, a scalable probabilistic inference engine which was later commercialized as Lattice Data. Led research project as a Toshiba intern. Using DeepDive to extract patent claim structure for analysis and comparison. Introduced GameRank, a ranking algorithm to rank pitchers and batters in baseball networks. 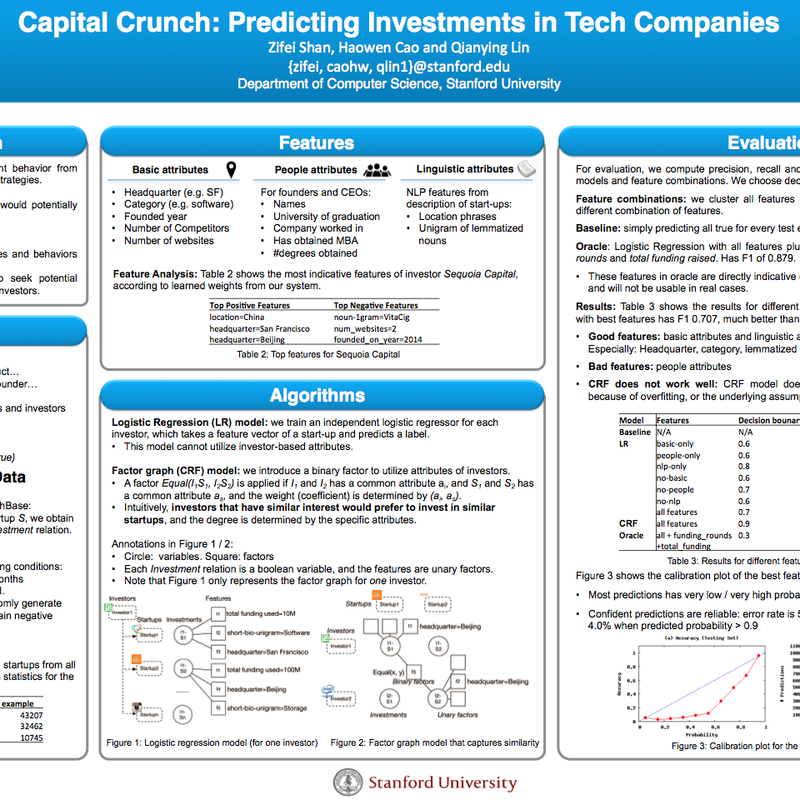 Predicting Investments in Tech Companies. Interactive ideation system, assisting humans in the brainstorming by automatically suggesting new ideas. 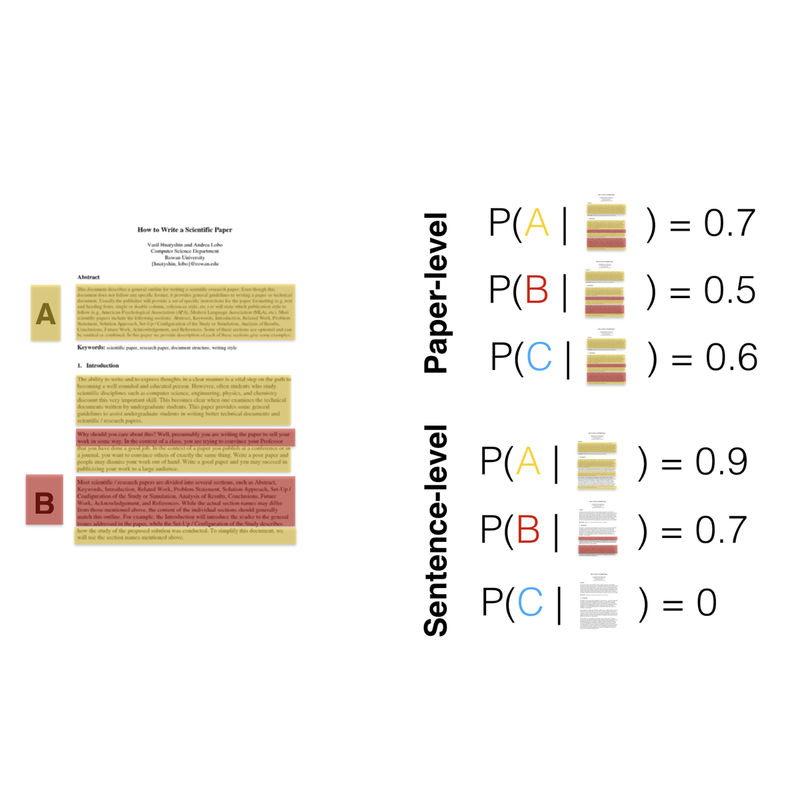 Predict the authors of scientific publications in a multi-author setting, using writing style features. 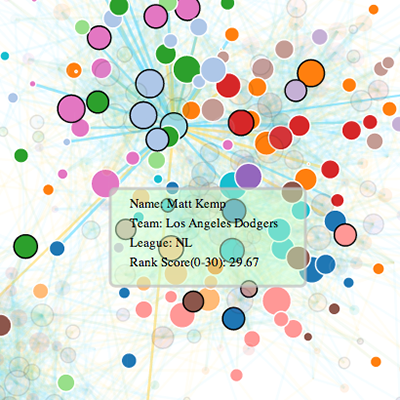 Visualizing the MLB player networks with player statistics, using GameRank algorithm. I wrote a Shooting Game on my own using OO programming with a very low-level C++ library called Haaf's Game Engine. Designed the "barrages" (bullet movements) using a force model. There are 3 stages with many enimies. 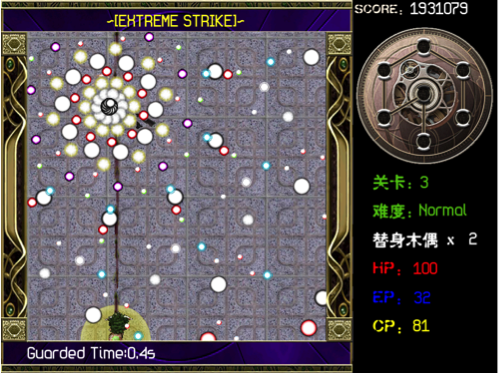 It was too hard that I could rarely win the "hard" mode.